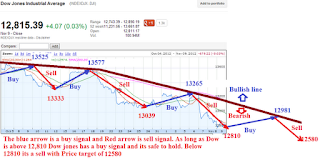 Dow jones is expected to be in the range of 12,700 - 12974 range with closing Price target of 12742. Below is the trading plan for this week. 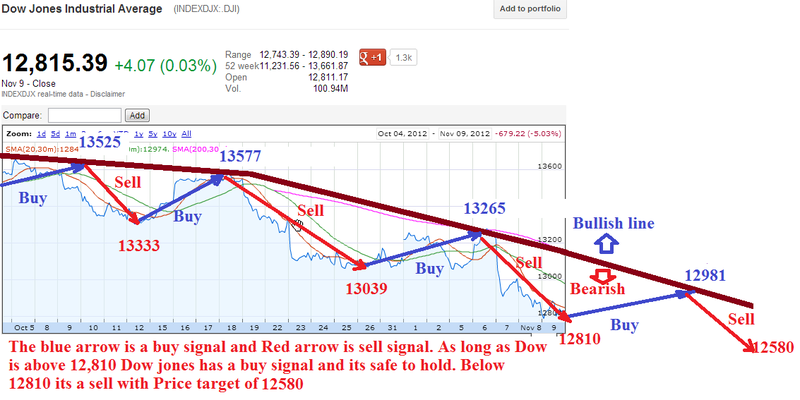 As long as Dow jones is above 12810 its a buy with PT of 12974. Below 12810, Dow jones is a sell. In S&P500, above 1381 is a buy with PT of 1398 and below 1381 its a sell with Pt of 1365. 1372 is the expected closing PT for Nov 16th. Dow jones weekly outlook expected to close at 12742 unless it moves above 12810 then closing Pt is 12974. What will happen if Fiscal cliff is not resolved ? Below i have presented two chart to show what will happen if US fiscal cliff is not solved. Chart for S&P500 if Fiscal cliff is not resolved.